A stunning phone with amazing battery life that's only let down by an overbearing UI. 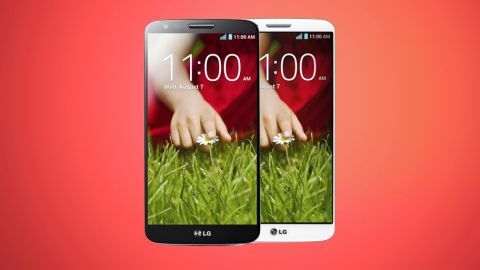 The LG G2 is a beastly smartphone and it was LG's answer to 2013's Samsung Galaxy S4 and HTC One. It's a large, yet not unwieldy, smartphone brimming with specs that would make the most discerning geeks drool. LG has been a distant cry from where Samsung and HTC have found themselves in terms of popularity and smartphone ownership, although with the Nexus 4, Nexus 5, and G2 under its belt the Korean firm has got itself back on the smartphone map. While it's now been succeeded by the LG G3 and its stunning QHD display, the G2 is still available and at a cracking price making it a really great option if you're on a bit more of a budget. In fact, with a SIM-free price of around £300 it's more than £150 cheaper than the 2014 flagship brigade, and while it may not sport Qualcomm's latest Snapdragon 801 chip it still has the strong 800 version, a full HD display and Android 4.4.2 KitKat. If you don't fancy parting with £300 up front you can now pick the LG G2 for free on contracts starting at £21.99 per month. With the G2, it seemed that LG took a lot of cues from its Korean counterpart and built what many called a Galaxy S4 clone. It's large, made of lots of plastic, shaped similarly and is jam-packed with more features than a single person can handle. During its New York City presentation, I was a little baffled at what LG decided to highlight as the G2's key features. The first and most evident is the placement of the power button and volume control keys. LG went to great lengths to explain how it was listening to customers and observing their usage patterns. Somehow it all led to the awkward placement of those buttons, along with a few other things the phone can do. Diving right into what powers the LG G2 and makes it purr, you'll first notice a 5.2-inch 1920 x 1080 display, which gives us a 424ppi density and means it still keeps pace with the likes of the Samsung Galaxy S5 and Sony Xperia Z2. The chipset inside is a 2.26GHz quad-core Snapdragon 800 and as far as processing power, it seems that the G2 is in no short supply. It comes in 16GB and 32GB variants, with 2GB RAM backing up that meaty processor, while connectivity includes Wi-Fi, Bluetooth, NFC, an IR blaster on the top of the G2 and 4G LTE. The camera on back is a 13MP shooter with a small LED flash. Like other high-end Android smartphones, it has a few tricks up its sleeves, too, but we'll get into that in our camera section. LG also made a big deal out of the battery in this thing, which is a 3000mAh Li-Po (Lithium Polymer) battery - that's larger than the HTC One M8 (2600mAh) and Galaxy S5 (2800mAh), while the G3 sports the same size power pack as its predecessor. Despite being a 5.2-inch display device, the LG G2 is very manageable in the hand. It still takes a reach to get your thumb diagonally across the screen, but it's not so huge that it becomes cumbersome. While it has the same size screen at 2014's Xperia Z2, the G2 is smaller in terms of height and width measuring in at 128.5 x 70.9mm. That also makes its smaller than the Galaxy S5 and One M8 which boast 5.1-inch and 5-inch displays respectively. To undiscerning eyes, it can be quite hard to tell the difference between the G2 and the Galaxy S4. One can argue that there is only so much you can do with the modern-day smartphone form factor, but then again HTC and Sony have very distinct designs. The edges of the device are clean, free of volume controls and a power button. The bottom edge of the phone has a 3.5mm headset jack, micro-USB port and a speaker and microphone. The G2's backside is the business end of the phone. LG decided to put the volume buttons and power button just underneath the camera module. LG says its the reason the volume and power keys were placed on the back is because that's where your finger naturally wants to rest when you're talking on your phone, which I generally found to be true. It can become awkward feeling around for the buttons, as In order to get enough pressure onto the power button, you have to hold the G2 a little awkwardly and make sure you get the correct leverage. But the South Korean brand has made a huge effort to mitigate this, with elements like double knocking on the screen to open it up (which removes the need to press the power button) and most apps have an onscreen volume control to play with. Plus over time I noticed myself becoming increasingly okay with the placement of the keys - to the point when I switched phones and found that I was pressing the camera lens to turn the phone on. Aside from the power/volume buttons and the camera module on the backside, there isn't a whole lot more going on back there. The metal-looking LG logo towards the bottom of the device however turns out to be just a few stickers, which over time have started to fall off. The plastic rear chassis also gets beaten up pretty easily, and if you're not careful your G2 will pick up various dents and markings. I recommend purchasing a case to prolong its life and keep it looking smart. Up front you won't find any physical buttons at all. The back, home and menu buttons are all soft keys on the display, and will respond with haptic feedback unless you disable it. Overall, the design of the LG G2 is nice, with the exception of the placement of the power and volume buttons. And although I'm not particularly fond of an all-plastic body, it's not so bad and I found the G2 to be a well built, solid device.